The NWTC has 16 new charging stations for staff use that will also provide valuable data to PowerFlex. Powerflex’s Wells Fargo Innovation Incubator (IN2) project is underway with the recent installation of a suite of 16 new electric vehicle (EV) charging stations at the National Renewable Energy Laboratory’s (NREL’s) National Wind Technology Center (NWTC). 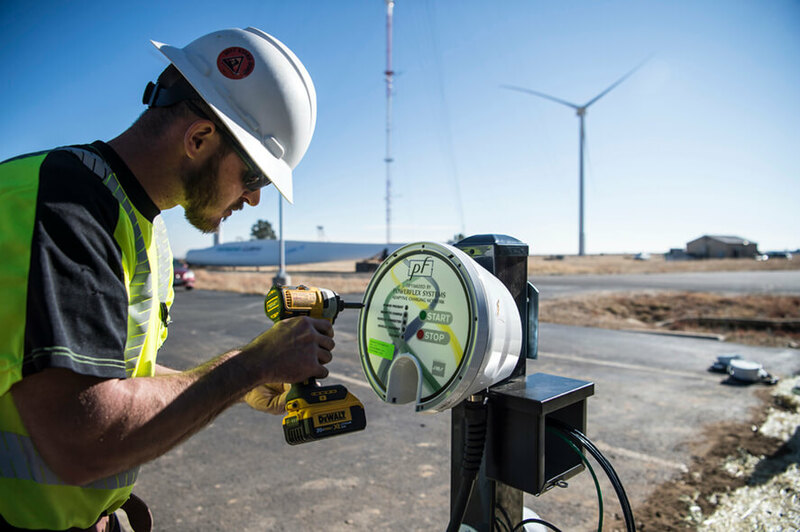 The new stations are a win-win for both NWTC employees and PowerFlex, a service company that develops, deploys, and manages large-scale adaptive charging networks. As part of the company’s participation in IN2, NREL researchers are validating PowerFlex’s technology. Because the NWTC has a higher-than-average EV adoption rate, the new charging stations will provide valuable insight and data to PowerFlex, while also reducing infrastructure costs and decreasing impact on peak electrical demand for the NWTC. NREL Vehicle to Grid Integration Engineer Andrew Meintz is the lead researcher on the project. In a recent CHARGED Magazine story titled “When EVs are Everywhere,” PowerFlex Systems, referring to EVs, says, “This is the first truly new consumer device to be introduced in almost 20 years.” He anticipates EVs will have the biggest impact on electrical systems and the grid since the widespread adoption of television in the 1950s. This is why his company is starting to ask questions such as: How do you charge all of the new loads efficiently? And what happens when hundreds of vehicles are plugged in at the same parking lot around the same time? Existing solutions aren’t ideal, as they involve either providing maximum charging power to each EV (which means the electrical infrastructure must be sized to accommodate the maximum capacity of all chargers, at huge expense to property owners), or placing all the chargers on a circuit that limits the current output, which can impact drivers’ ability to get the charge they need to reach their next destination. PowerFlex says its Adaptive Load Management product is the best technology to balance the growing new grid load from EVs while keeping both property managers and drivers happy. It incorporates driver inputs and real-time electrical load monitoring (including building loads such as lighting and air conditioning, as well as energy supplies such as solar and battery storage) to determine which vehicles get how much energy and when.